or click on the car below. Pacifica Radio Archives presents a completely unique reading of one of the most important dystopian novels written in modern history, George Orwell's classic Nineteen Eighty-Four. The entire book was read on-air by longtime Pacifica morning show host Charles Morgan in 1975. Morgan was joined by legendary voice over artist June Foray, widely known for her work in Disney and Warner Brothers animated productions - in particular as the voice of Rocky in the Rocky and Bullwinkle cartoon. "Every era, it seems, produces its own 1984, and this one sounds as resonant in the 21st century -- a time even Orwell dared not imagine -- as it must have in the 1970s." Fifty years ago, in 1967, one of Pacifica's most iconic figures, Alan Watts, gave a lecture titled Zen Bones - about the temporal nature of life and about the need for Americans to readjust their priorities. Watts had gained popularity as one of the original early hosts on Pacifica Radio's flagship station KPFA in Berkeley, California; his eloquent, simple, and insightful presentation of Eastern spiritual and philosophical concepts made him a very popular listen and one of the leading experts on Zen Buddhism. This week on From the Vault we pay tribute to this iconic radio personality and the fiftieth anniversary of one of his most popular talks. Congratulations Bob Dylan - 2016 Nobel Prize in Literature! Check out the brand new animated film based on an historic Bob Dylan recording from Pacifica Radio Archives! Quoted Studios, a nonprofit dedicated to uncovering, preserving and reimagining the American interview, produces their signature series Blank on Blank in collaboration with PBS Digital Studios. We've compiled our Bob Dylan recordings onto one MP3 disc... reserve your copy of Bob Dylan on Pacifica Radio today! with a new collection from Pacifica Radio Archives featuring Ali in conversation with Julius Lester (1968), Ali and Joe Frazier talking shop the night before the "Fight of the Century" at Madison Square Garden (1971), original music, and a speech Ali gave to UCLA students in 1968 amidst campus-wide protests. American Women Making History and Culture: 1963-1982 is LIVE! The Pacifica Radio Archives is pleased to announce that the American Women Making History and Culture: 1963-1982, an NHPRC grant-funded preservation project documenting women's contributions to Pacifica Radio programming from 1963-1982, is now completed! 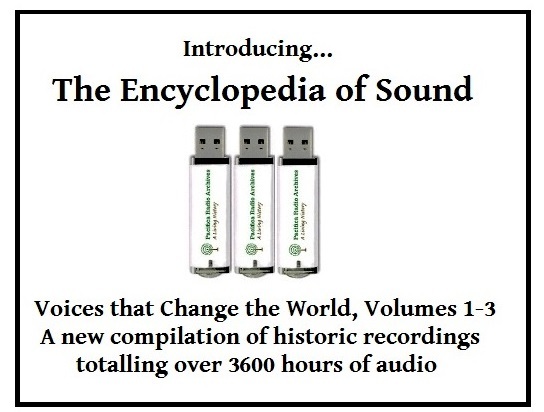 2,024 recordings have been digitized and are now accessible to the public! Click here to learn more!